In 2001 and 2004, Sparton Electronics (now Sparton DeLeon Springs LLC) was awarded Navy contracts for sonobuoy research and development and engineering and technical services related to submarine acoustics. Some of the work required under these contracts was farmed out to Jackson Engineering, an affiliated company of Sparton. By January 2007, the Government had reimbursed Sparton for about $577 thousand representing the cost of work performed by Jackson Engineering. In 2007 and 2008, Sparton submitted timely final indirect cost rate proposals for its fiscal years 2006 and 2007. Both of these proposals included the required "Schedule I"s, Cumulative Allowable Cost Worksheet (CACWS) but neither Schedule I included the cost of the intra-divisional work performed by Jackson. In September 2013, DCAA (Defense Contract Audit Agency) issued audit reports covering those years, noting that the Schedule I's did not include the Jackson costs. Eventually, the parties executed final indirect cost rate agreements after which Sparton updated its Schedule I's to reflect the the negotiated rates. The "final" Schedule I's still did not reflect the Jackson intra-divisional costs. In August 2014, the contracting officer requested Sparton to submit final vouchers for the completed contracts/delivery orders. Sparton submitted the final vouchers that included the previously invoiced and paid Jackson costs. In October 2015, the contracting officer issued a final decision demanding that Sparton repay $577 thousand that the Government had reimbursed it for work performed by Jackson. Evidently, Sparton was unable to satisfy the contracting officer's request for support for the costs. The contracting officer wrote: "There is no proof whatever that (Sparton) was billed for work or more importantly, that (Sparton) paid these costs in connection with any Government contract". In January 2016, Sparton appealed the contracting officer final decision to the ASBCA (Armed Services Board of Contract Appeals) and the Government filed a complain alleging that Sparton had been overpaid because the Jackson costs were insufficiently supported. Sparton eventually requested summary judgment that the Government's claim was time-barred under the Contract Disputes Act (CDA). Summary judgment can be granted if the movant (i.e. Sparton, in this case) shows that there is no genuine dispute as to any material fact and the movant is entitled to judgment as a matter of law. Under the CDA, the Government must bring a contract claim against a contractor within six years after the accrual of the claim. A claim accrues on the date when all events that fix the alleged liability of either the Government or the contractor and permit assertion of the claim were known or should have been known. There was no dispute that the contracting officer first claimed there was an overpayment on October 26, 2015; consequently, to be timely, that claim must not have accrued earlier than October 26, 2009. The Board found that the Government knew, or should have know of the Jackson costs in January 2007 when it paid those costs pursuant to the interim vouchers that were reimbursed and by the Government's own admission, included information related to the Jackson costs. Moreover, the Government knew or should have known by January 2008 that Sparton had not included the Jackson costs in its indirect cost proposals. Thus, there is no genuine dispute that the Government's claim accrued no later than either January 2007 or January 2008. Both dates precede the October 2009 cut-off for statue of limitations purposes. The ASBCA granted Sparton's motion for summary judgment and Sparton's appeal was sustained. The decision doesn't mention why Sparton was unable to satisfactorily support the intra-divisional costs. It mentioned that Jackson had gone out of business in 2006 so perhaps the records supporting the intra-divisional transfers were no longer available. You can read the entire ASBCA decision here. Last week, we reported on the President's moratorium on new regulations; no new regulations can be sent to the Federal Register until approved by someone appointed by the new administration and a 60 day freeze on those already published but have not taken effect. Today, the President signed another Executive Order (EO) that should dramatically reduce the number of regulations. It requires agencies to cut two existing regulations for every new rule introduced. It will also set a cap on the cost of new regulations. For fiscal year 2017, the cap is set at $0. The two for one plan is aimed at reducing regulator burdens on the private sector, especially small businesses. Agencies must self-identify the regulations to cut although the White House will have final say on the matter. You can read the full text of the EO here. Allowability of Consultant Costs Does Not Necessarily Depend Upon the Existence of "Work Product"
Earlier this month, the ASBCA (Armed Services Board of Contract Appeals) published its decision on a wide range of cost issues that were disallowed by a DCMA (Defense Contract Management Agency) administrative contracting officer (ACO). The contractor, Technology Systems, Inc. (TSI) challenged the ACO's decision, winning on some of the issues and losing on others. The decision is very informative in helping Government contractors understand and apply FAR cost principles and we will spend a few days discussing various aspects of the decision. Today we start with the ASBCA position on what constitutes "adequate support" for professional and consultant service costs. SMI was a consultant hired by TSI to provide it with both marketing and lobbying services. It had separate agreements with TSI for each and invoiced TSI separately for each. The contracting officer disallowed about $51,000 for the marketing services on the grounds that TSI did not provide enough documentation to permit an understanding of the work performed nor did it provide the "work products" and other itesm that the ACO believed were required in accordance with the provisions of FAR 31.205-33(f)(2) and (3). FAR 31.205-33, Professional and consultant services costs provides that fees for services rendered are allowable only when supported by evidence of the nature and scope of the service provided and that evidence necessary to determine that work performed is proper and does not violate law or regulation shall include agreements, invoices, and work products. The government labors under the false impression that the FAR requires a consultant to create "work product" merely for the purposes of proving its costs. Though the FAR language in question is not as clear as we might like, it can be read - as we read it here - to impose no such requirement. Moreover, we have factually found the invoices submitted by TSI to be adequate to support a finding that TSI incurred the charged costs for SMI's marketing activities. The government makes a superficially persuasive argument, that the FAR's statement that the evidence necessary to determine that the work is proper "shall include ... work products" and related documents, makes the provision of such documents mandatory. The problem with this interpretation of the FAR is that it does not account for the case in which such documents were never created by the consultant. Moreover, it does not account for the case where, as here, the invoices include the data that the FAR defines as work product, such as persons visited and subjects discussed. We further note, that DCAA's own audit manual reflecting the government's own interpretation of this FAR requirement, provides that "the auditor should not insist on a work product if other evidence provided is sufficient to determine the nature and scope of the actual work performed. Thus, we conclude that FAR 31.205-33(f) may require the provision of a consultant's work product, if it exists, but is not so rigid as to require its creation when it would not otherwise be necessary for the consultant to perform its duties. To be sure, any lack of work product makes it more difficult for a contractor to prove that it incurred the costs for which it seeks compensation, and the lack of work product in an instance where the consulting work was of such a scale or scope that work product would be expected may properly subject the costs to question. As with most things, the proper amount of documentation and work product to be expected will largely depend on the scope of work performed, and we do not conclude that the FAR intended to impose "make work" upon consultants that would only lead to higher costs to the contractor which would then be imposed upon the taxpayer. The burden of supporting professional and consultant service costs (as with any costs charged to Government contracts) is squarely on the contractor. However, if, as in this case, there is no formal work product, FAR allows for alternative evidence to support the nature and scope of the actual work performed. The full ASBCA decision may be downloaded here. The Department of Justice (DOJ) announced a settlement with a DOE contractor who agreed to pay $5 million to resolve a couple of issues including a charge that it billed the Government for internal audit work by an individual that had no auditing experience and failed to provide any meaningful oversight of the Audit Department. The government also alleged that WRPS charged the government for auditing work that was not performed. WRPS allegedly installed as the head of the contractually required Internal Audit Department for the first three years of the Tank Farms contract its own general counsel, who allegedly had no auditing experience and failed to provide any meaningful oversight of the Audit Department. The government alleged that this knowing violation of an important safeguard in the contract enabled the extensive timecard fraud. When WRPS was awarded the DOE "Tank Farm" contract in 2008, it was advised by law enforcement of specific concerns about systemic timecard fraud being committed by the previous contractor, many of whose employees and procedures were retained by WRPS. However, WRPS made no actual changes to the timekeeping procedures at the Tank Farms for nearly five years and did not take steps until after July 2013, to curtail the prior fraudulent practices. As a result, the Government alleged that WRPS knowingly charged DOE for overtime for busy work or for work that was not actually performed and premium emergency call-in pay that was not authorized by the contract. To settle these two issues, WRPS agreed to pay $5,275 million. The claims resolved by the settlement are, of course, allegations only. There has been no determination of liability. Yesterday, we reported the President's goal of reducing regulations by 75 percent. That, or course, is a very ambitious goal and whether he can roll back the number of pages of regulations to the early 1970s level is questionable but a very worthy goal. But, the President has already begun - he has instituted a freeze on all new regulations. 1. Subject to any exceptions the Director or Acting Director of the OMB (Office of Management and Budget allows for emergency situations or other urgent circumstances relating to health, safety, financial, or national security matters, Executive Agencies may send no regulations to the Office of the Federal Register (OFR) until a department or agency head appointed or designated by the President after noon on January 20, 2017, reviews and approves the regulation. 2. With respect to regulations that have been sent to the OFR but not published in the Federal Register, immediately withdraw them from the OFR for review and approval. 3. With respect to regulations that have been published in the OFR but have not yet taken effect, as permitted by applicable law, temporarily postpone their effective date for 60 days for the purpose of reviewing questions of fact, law, and policy they raise. Where appropriate, consider proposing for notice and comment a rule to delay the effective date beyond the 60-day period. You may read the entire directive, signed by the President's Chief of Staff here. President Trump told business leaders yesterday that he wanted to cut regulations by 75% or more. 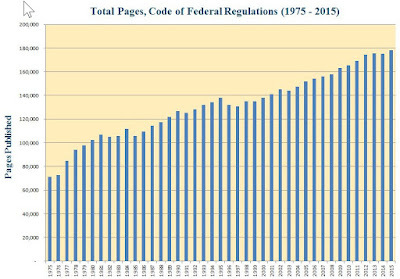 That would be a good start and take us back to the early 1970s in terms of number of pages of regulations. Currently, the Code of Federal Regulations (CFRs) is about 180,000 pages (or about as high as the Washington Monument). Within those 180,000 pages is the Federal Acquisition Regulations (FAR) which takes up about 1,500 pages. Within the FAR are cost principles that take up 50 or so pages. Many people make a career of being experts on cost principles which represents 0.028 percent of the CFRs. 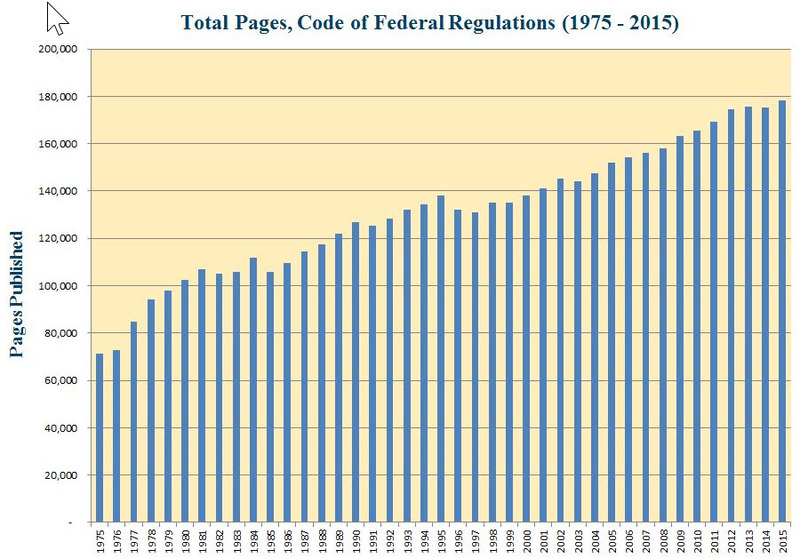 Each year for the past three years (at least), the last Administration set new records for the number of pages in the Federal Register. The Federal Register is the official journal for Government regulations and in Fiscal Year 2015, totaled 82 thousand pages. Found on those pages are 3,378 "final" rules and regulations of which 545 are recognized as having effects on small businesses. Regulations are promulgated to implement legislation passed by Congress and signed into law by the President. Another significant source of regulations are to implement Executive Orders (e.g. Fair Play and Safe Workplaces). "Final" regulations appear in the Code of Federal Regulations. Regulations resulting from EOs should be easy for the President to eliminate - rescind the EO and the corresponding regulation(s) have no basis. For regulations based on statute (perhaps the majority) however, the new Administration will need help from Congress. It will be interesting to see what can get done quickly. Certainly a lot of small businesses will appreciate fewer regulations. The Department of Energy (DOE) has oversight responsibility with respect to defined benefit pension plans sponsored by DOE contractors under M&O contracts (management and operating contracts) and other facility management contracts (FMCs) where the work was once performed under M&O contracts. These contracts are characterized by successor contractors being required to employ all or part of the former contractor's workforce and to assume sponsorship of the employee defined benefit pension plan. DOE has oversight responsibility with respect to these defined benefit pension plans. DOE's policy is to reimburse its contractors for minimum contributions required under ERISA (Employee Retirement Income Security Act of 1974). This funding amount sometimes differs from the amount required under CAS (Cost Accounting Standards) 412 and 413. As a result of the divergence of DOE's policy from the requirements of CAS 412 and 413, COE contractors sometimes find themselves in non-compliance with CAS. Therefore, DOE includes an indemnification clause, so to speak, in their contracts that protects contractors from liability for not complying with CAS. Even if the clause is not in the contract, it is DOE's policy not to disallow costs or otherwise penalize a contractor for CAS non-compliance due to the contractor's compliance with DOE direction. This indemnification clause does not waive CAS. In only indemnifies the contractor for non-compliance with CAS that are caused by the contractors following DOE written direction. DOE contractors must comply with all other terms of the contract (to the extent not precluded by DOE's direction), including those relating to the timing of funding that are found in the FAR and DOE FAR Supplement (DEAR) cost principles. DOE has published guidance that before requesting an audit of affected contracts, contracting officers must advise auditors of the divergence of DOE requirements from CAS 412 and 413 and direct auditors to audit to DOE's requirements when incongruities with CAS occur. Often, the divergence between DOE and CAS are due to budgetary constraints at the DOE level where insufficient funding is available to fund plans according to CAS. Target Media bid on a Navy SEAPORT-e solicitation to provide engineering and professional services in support of ship maintenance systems information technology. Target didn't receive the award and challenged the Navy's award to Imagine One. Among other challenges, Target Media argued that the Navy conducted an unreasonable cost realism analysis. Target argued that the cost realism evaluation was flawed because the Navy did not compare the compensation proposed by Imagine One to the rates paid to incumbent employees or to the prevailing market rates for such personnel to determine whether Imagine Once's cost approach aligned with its proposed technical approach. Where a cost-reimbursement contract is to be awarded, an offeror's estimated costs of contract performance should not be considered controlling since the estimates may not provide valid indications of the final actual costs which the Government is required to pay. That's why the Government must perform cost realism analyses to determine what the costs are likely to be under the offeror's technical approach, assuming reasonable economy and efficiency. The Comptroller General (CG or GAO) concluded that the Navy's cost realism analysis did not reasonable assess the likely costs stemming from Imagine One's proposed approach. Imagine One's proposal was based on a plan to recruit and retain a substantial number of contract personnel from outside the current employ of both Imagine One and its proposed contractor. It depended, to a large extent, on recruiting new hires or incumbent staff. However, the Navy's cost realism analysis did not analyze the realism of the proposed rates through such methods as comparing Imagine One (and its subcontractor) direct labor rates to prevailing market rates or to the salaries paid to incumbent staff. Instead, the Navy examined internal payroll data provided by Imagine One to verify proposed rates. The CG found that the Navy's cost realism evaluation failed to properly account for the technical approach proposed by Imagine One. While Imagine One proposed to staff a substantial portion of its personnel from external sources, the Navy limited its analysis to internal cost data from Imagine One (and its subcontractor). The Navy should have assessed the realism of the proposed rates through such methods as comparison of the rates to prevailing market rates, the rates paid to incumbent employees, or the rates proposed by other offerors. The CG sustained the protest on these grounds and recommended that the Navy perform a proper cost realism evaluation and professional compensation plan evaluation of Imagine One's proposal, and then rely on thsoe evaluations as part of its source selection determination. If, after that analysis, Target Media is determined to offer the best value to the Government, the Navy should terminate Imagine One's contract for convenience and award the contract to Target Media. Target Media was also awarded cost of filing and pursuing the protest. The FAR Councils issued a proposed rule to amend the Federal Acquisition Regulation(FAR) to implement one of the President's executive order; Planning for Federal Sustainability in the Next Decade. This proposed rule promotes the acquisition of sustainable products, services, and construction methods in order to reduce energy and water consumption, reliance on natural resources, and enhance pollution prevention within the Federal Government. Although the anticipated costs associated with this rule are not quantified in dollar amounts, the FAR Councils anticipate that any such impact will be outweighed by the expected benefits of the rule. The EO and the accompanying regulations direct Federal agencies, where life-cycle cost-effective, to promote sustainable acquisition and procurement by ensuring that environmental performance and sustainability factors are included to the maximum extent practicable for all applicable procurements. Sustainable products and services means products and services that meet statutory mandates for purchasing (i) recycled content products designated by EPA under the Comprehensive Procurement Guidelines, (ii) energy and water efficient products such as ENERGY STAR certified and Federal Energy Management Program (FEMP) designated products identified by EPA and DOE and (iii) bio-based content products meeting the content requirement of the Agriculture Department under the BioPreferred program. Also included in this definition are products and services identified by EPA programs such as SNAP (Significant New Alternatives Policy), WaterSense, Safer Choice, and Certified, SmartWay products. Finally, the definition includes environmentally preferable products or services that meet or exceed specifications, standards, or labels recommended by EPA. While this proposed regulation is based on a Presidential Executive Order (EO), the particular EO is found on many lists of EOs that could be rescinded once the new President takes office. It could be targeted for rescission for the simple reason that it will cost real dollars now in exchange for some nondescript intangible "future benefits". The proposed regulations are extensive and can be viewed here. We suspect that a lot of contracting officers are hoping that these proposed regulations will never become final because they will significantly add to their workloads. Back in July 2016, the Department of Veterans Affairs (VA) issued a solicitation for laundry services in the Los Angeles area. After the closing date for receipt of quotations, the VA reopened the solicitation on September 1, 2016 to increase the maximum award amount from $2.5 million to $10 million. A month later the VA cancelled the solicitation and at the same time, extended the existing contract with the incumbent contractor, Railroad Cleaners. Walker Development, one of the bidders, filed a protest with the GAO (or Comptroller General) arguing that the VA lacked a reasonable basis to conceal the solicitation. Walker argued that the cancellation was a pretext and that the VA's actual motivation was to award a contract to the incumbent, Railroad Cleaners, who, according to Walker, seemed to win all of the awards for laundry services from VA. Walker further argued that the VA had, in essence, made a sole-source award to Railroad Cleaners that foreclosed competition for the work. An agency may cancel an existing solicitation where it has a reasonable basis for doing so. The VA initially argued that it cancelled the solicitation because it listed a minimum amount of $1 million for the IDIQ contract and Walker's quotation was under that amount. Later, the VA argued that the minimum dollar setting was $2.5 million. The VA stated that it would not be able to make an award to any vendor that submitted a quote under that amount as, in effect, it would be guaranteeing the contractor that at least $2.5 million would be spent. GAO found that the VA failed to produce a report that coherently addressed its rationale for the cancellation. Rather, it provided conflicting rationales for the cancellation. Additionally, the VA provided no evidence indicating a guaranteed minimum of $2.5 million. Although the GAO afforded the VA numerous opportunities to provide its rationale for the cancellation, the VA failed to avail itself of those opportunities. In the absence of an adequate VA record to support its actions, and in the absence of any reasonable explanation for its actions, the GAO was left with no option but to make an adverse inference in this matter. The GAO concluded that the record did not establish that the VA had a reasonable basis for the cancellation of the solicitation and so, it sustained Walker's protest. The GAO ordered the VA to reinstate the solicitation, terminate Railroad Cleaner's contract, and reimburse Walker the cost of filing and pursuing the protest. The owner of a Kansas City construction company and a co-conspirator (the veteran) were indicted last Friday by a Federal grand jury for their roles in a "rent-a-vet" scheme to obtain nearly $14 million in federal contracts.The Department of Justice announced the indictment in a press release last Friday. The two individuals participated in a conspiracy to defraud the Government by falsely representing that Patriot Company was a veteran-owned or a service-disabled veteran-owned small business in order to fraudulently obtain approximately $13.8 million in Government contracts for work in nine states. According to the indictment, Patriot Company was a front company for a non-veteran owned construction company who used another person's veteran and service-disabled veteran status in a "rent-a-vet" scheme to bid on Government contracts. As a result of the fraud scheme, legitimate veteran-owned and run businesses were not awarded the contracts that were awarded to Patriot. The service-disabled veteran implicated in this scheme worked full time for the Department of Defense. Although nominally the President of Patriot, he did not actively control the day-to-day management, daily operation or long-term decision making. He never managed a construction company prior to his involvement with Patriot and had limited Government contracting experience. According to the Press Release, the real owner of the company was living very well, using more than $600 thousand in company funds to buy a couple of homes and using another $400 thousand to buy life insurance policies. The poor rent-a-vet schmuck didn't seem to get anything out of the deal except, now, a lot of grief. There was no mention as to how the fraud was uncovered. We know that the Government has been scrutinizing set-aside awards lately to ensure the propriety of awardees' status. Perhaps that's how this particular scheme was uncovered. Indictments, of course, are only accusations and not evidence of guilt and not conviction. The FAR Councils published a final rule last week that prohibits contracting with any company that requires employees (or subcontractors) to sign internal confidentiality agreements that restrict such employees (or subcontractors) from lawfully reporting waste, fraud, or abuse to a designated Government representative authorized to receive such information. This restriction on contracting applies to grants and cooperative agreements as well. Internal confidentiality agreements (or statements) in this context means a confidentiality agreement or any other written statement that the contractor requires any of its employees or subcontractors to sign regarding nondisclosure of contractor information, except that it does not include confidentiality agreements arising out of civil litigation or confidentiality agreements that contract employees or subcontractors sign at the behest of a Federal agency. If there are any such confidentiality agreements on file, contractors are required to give notice to current employees and subcontractors that any prohibitions and restrictions of any preexisting confidentiality agreements or statements covered by the new restriction are no longer in effect, to the extent that such prohibitions and restrictions are in conflict with the new provision. The implementation of this new rule will be done on the honor system. In order to be eligible for contract award, an offeror must represent that it will not require its employees or subcontractors to sign internal confidentiality agreements or statements prohibiting or otherwise restricting such employees or subcontractors from lawfully reporting wase, fraud, or abuse related to the performance of a Government contract to a designated investigative or law enforcement representative of a Federal department or agency authorized to receive such information (e.g. agency Office of the Inspector General). Any offeror that does not so represent is ineligible for award of a contract. Contracting officers may rely on the offerors' representations unless the contracting officers have reason to question the representation. The new regulation is effective immediately. The rules governing allowability of legal costs when a contractor has been charged with some form of wrongdoing is fairly well established. Generally, if the case is resolved by something other than compete vindication, the associated legal (and other related) costs will probably be questionable. FAR 31.205-47 describes it this way. Costs incurred by a contractor in connection with any criminal, civil, or administrative proceeding commenced by the United States, by a State, or by a contractor or subcontractor employee submitting a (whistleblower) complaint or a third party in the name of the U.S. under the False Claims Act (i.e. Qui Tam), are not allowable as reimbursable costs if the proceeding relates to a violation of or a failure to comply with a Federal or State statute or regulation and results in one of several possible dispositions. In the case of a criminal proceeding, a conviction (including a conviction pursuant to a plea of nolo contendere) by reason of the violation or failure. A final decision to debar or suspend the contract, to rescind or void the contract, or to terminate the contract for default. A disposition of the proceeding by consent or compromise if such action could have resulted in a disposition described in items 1 to 4 above. On January 13, 2017, the FAR (Federal Acquisition Regulations) Councils amended FAR 31.205-47, Costs related to legal and other proceedings, to prohibit costs incurred in connection with a Congressional investigation or inquiry into an issue that is the subject matter of a proceeding resulting in a disposition as described in items 1 through 5 above. So, if your company is offered the "opportunity" to testify before Congress for, say polluting a river, the costs of that testimony including prep time, travel, and other incidental expenses as well as directly associated costs, would not be allowable under Government contracts if one of the five dispositions applied. This regulatory change was required under the fiscal year 2015 NDAA (National Defense Authorization Act) and although the underlying statute applies to DoD contracts only, the regulation applies to all Government contracts. It is effective now. Yesterday, the Office of Management and Budget (OMB) extended the policy to expedite payments to small businesses for another year. See Extension of Policy to Provide Accelerated Payments to Small Businesses and Small Business Subcontractors. This policy goes back to 2011 when the OMB established it for small business prime contractors. It became readily apparent however that many more small businesses were subcontractors rather than prime contractors so in 2012, OMB extended the policy to prime contractors so that they could, in turn, expedite payments to their small business subcontractors. The payment goal for the Government under this policy is 15 days after receipt of all required documents. However, prime contractors are not obligated to the 15 day rule but by the terms and conditions of their subcontract documents. In any event, prime contractors should be endeavoring to abide by the intent of the policy. Unfortunately, many small business subcontractors have not benefited from the policy. Perhaps that will change. The extension carries some reporting requirements that includes, among other things, quarterly reporting on the progress of any other steps that the agency has undertaken to ensure that small business contractors and small business subcontractors are paid in a prompt manner. In order to prepare such a report, agencies will need to engage their prime contractors to see how well they have implemented the accelerated payment policy to their small business subcontracts. The added oversight may help. It seems like U.S. Senators are competing to see who can identify the most wasteful Government spending. Last November, Oklahoma Sen. Lankford issued his second annual edition of Federal Fumbles wherein he chronicles 100 examples of wasteful, or at least questionable federal spending. Then last month, Arizona Sen John McCain issued a similar publication entitled America's Most Wasted - Time to Arrest America's Out-of-Control Spending. Now, Arizona Sen Jeff Flake has published his own listing of 50 examples (worth more than $5 billion) in wasteful Government spending. 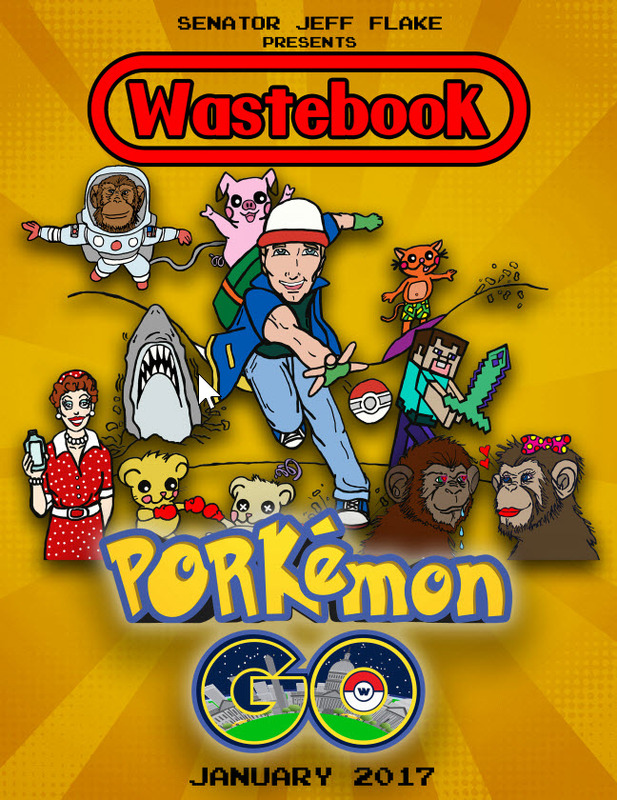 This latest publication is entitled PORKemon Go, named after the popular mobile app Pokemon Go. Three exposes in three months is a lot of waste. NSF grant to determine whether boys or girls spend more time playing with Barbie dolls. NSF grant to see if dinosaurs were able to sing. DoD funding of a spaceport in Alaska that is rarely used. DoD funding research to determine how to be more popular online. We think that the other 97 Senators better get picking before the low-hanging fruit is gone. Earlier this year, several House Democrats and Republicans introduced a bipartisan bill to help solidify ridesharing and other innovative transportation services as part of the broader Government transportation "ecosystem". The Bill would give federal employees greater flexibility and choice when they travel on official business, and, according to the press release, "bring government travel into the 231st century". Innovative modes of transportation refers to companies like Uber and Lyft but also includes bikesharing (popular in Europe but heavily subsidized in the US). At congressional request, GSA (General Services Administration) agreed to remind agencies that they can reimburse employees' ridesharing expenses for official travel. The new bill will require that Agencies keep transportation options for federal workers updated to reflect the most cost-effective technology. GSA will be required to implement regulations to allow federal employees to use alternative transportation options such as Uber, Lyft, and bike-share for official travel. The Bill would also require GSA to submit annual reports to Congress on the implementation of these regulations and resulting amount of government savings. Contractors may also have an opportunity to reduce travel costs by "encouraging" employees to use these alternative transportation options. The rapid rise in the popularity of Uber and Lyft for personal use means that the services are both convenient and cost-effective. Unless contractors have travel policies and procedures that encourage employees to consider these alternative options however, employees will often resort to the familiar methods (e.g. taxis, POVs, and airport shuttles). It wouldn't surprise us if in the not too distant future, the FAR cost principles will be addressing these alternative transportation options. Pass-through costs are indirect costs and profit/fee applied to subcontract costs. Excessive pass-through costs are those that add no or negligible value to a contract. No or negligible value means that the contractor could not demonstrate to the contracting officer's satisfaction that its effort adds value to the contract in accomplishing the work to be performed under the contract. Six years ago, FAR (Federal Acquisition Regulation) was amended to prohibit contractors from claiming claiming excessive pass-through costs (see Excessive Pass-Through Costs). There are two parts to that prohibition - solicitation phase and contract phase. In the solicitation phase, if a contractor intends to subcontract more than 70 percent of the total cost of work to be performed, it must specify the amount of indirect costs and profit/fee applicable to the subcontracted work and provide a description of the added value it provides as related to the work performed by subcontractors. Of course we all know that circumstances change between the proposal submission and actual performance so the regulations also require contractors to notify the contracting officer when the level of subcontracted effort exceeds 70 percent (whether proposed that way or not) and some kind of verification that it has provided added value. If the contracting officer determines that excessive pass-through charges exist, the excessive costs are unallowable. The contract provision also gives the Government the right to examine and audit all contractor records necessary to determine whether the contractor proposed, billed, or claimed excessive pass-through charges. Later in 2011, we published a three part series on how the Government intended to review and audit implementation of the excessive pass-through cost prohibition (see Excessive Pass-Through Costs, Part 1, Part II, and Part III) wherein we highlighted guidance that DCAA (Defense Contract Audit Agency) had published. Essentially, the guidance focused on compliance with the notification requirements if the level of subcontracting exceeded 70 percent. Noncompliances were to be reported to the contracting officer for a determination of whether pass-through costs were excessive on a case-by-case basis. During audits of incurred costs, auditors are directed to use the information contained in contractors' incurred cost proposals to ascertain whether any contracts approach the 70 percent threshold. Then, depending on the contract clause, will perform one of two analyses. If FAR 52.215-23, Alternate I is included, the contracting officer already made a determination at the time of award that the prospective contractor has demonstrated that its functions provide added value to the contracted effort and there are no excessive pass-through charges. When Alternate I is present, auditors will compare the contractor demonstrated value-added functions with those disclosed to the contracting officer at the time of award to ensure the functions billed or claimed are consistent with the contracting officer determination. Additionally, the auditor will ensure that the disclosed value-added functions were performed and are reasonable. If the contract does not contain the FAR Alternate I clause, the auditor is directed to perform procedures to determine if the contractor incurred excessive pass-through charges. This will include a request that the contractor identify the value-added functions it provided and a verification that the disclosed functions were performed, are reasonable and represent value-added effort, If the auditor concludes that the functions were not performed or add no negligible value to the contract, he/she is directed to question excessive pass-through costs (i.e. all of the indirect and profit/fee attributable to subcontract costs). Obviously, there is a subjective element to the analysis that the auditor is required to perform and in some cases, may not be qualified to make. Our advice to contractors should auditors begin inquiring into this area is to engage your contracting officer as early in the process as possible. Ultimately the determination as to whether pass-through costs represent value-added is the contracting officer's responsibility and if you can obtain contracting officer concurrence before an audit report is issued, a lot of time and effort will be saved. Are you covering health care costs for ineligible dependents of your employees? No? How do you know? Can you prove it to a contract auditor? Back in 2012 and 2013, health care costs associated with ineligible dependents (e.g. divorced spouses and "aged-out" children) was a hot-button topic within the DoD contracting community. Eventually, DoD modified its FAR Supplement (DFARS) to make such costs specifically unallowable. In publishing the rule, DoD stated its belief that contractors should have adequate internal controls to ensure improper healthcare charges are excluded from fringe benefit costs. The new rule was published to encourage contractors to adopt reasonable internal controls to eliminate costs that are already unallowable. We can't argue with that and we wrote about the new rule, its implementation, and the Government's oversight activities extensively. See, for example here, here, and here. The brouhaha has quieted considerably since 2013. By focusing on "reasonable internal controls" to ensure improper healthcare charges are not passed on to the Government, DoD quieted the demands from some contract auditors who were challenging contractors to produce painstaking detailed proof of eligibility, sometimes going back five years or more. Back then, at least at some contractor locations, contract auditors did not focus on internal controls but demanded individual by individual proof of dependent eligibility. In one case, auditors were demanding that a contractor "prove" that a dependent was a student five or so years earlier and therefore qualified to receive medical benefits under the company's medical care plan. We never really understood the audit concerns from a risk standpoint. While there may have been instances where ineligible dependents were benefiting from an employer's health care plan, there was never any evidence to suggest that it was widespread and material. Even if there were egregious examples (and none were ever publicized), the extra cost probably would not have moved the fringe benefit rate and therefore, no impact on Government contracts. Contract auditors wasted a whole lot of time on matters that were immaterial and had no payback in terms of reduced fringe rates. Health Care Costs. As part of the review of health care costs, verify the contractor included only health insurance premiums and claims for “eligible dependents”. Request the contractor to demonstrate its procedures for ensuring only costs related to eligible dependents have been included in the claimed costs. Based on the understanding of the contractor’s processes and overall risk, design procedures to test claimed costs are related to only eligible dependents. Good controls reduce risks and will result in reduced testing. Its that simple. Existing statutes and regulations require the Government to ensure that its requirements with respect to a procurement of supplies or services are stated in terms of (i) functions to be performed, (ii) performance required, or (iii) essential physical characteristics. This is necessary so that commercial items, to the extent practical, can be procured to fulfill such requirements and sellers of commercial items are provided an opportunity to compete in any procurement to fill such requirements (see 10 USC 2377). Although the regulations impose a strong preference to purchase commercial items, contracting officers must also determine that prices are fair and reasonable. Just because a price is in a catalog or just because a contractor sells the same or similar items commercially, does not mean that the prices quoted to the Government are fair and reasonable. Perhaps there are other vendors offering commercial items that meet the Government's needs for lower prices. Anecdotal evidence suggests that in their push to buy commercially, to comply with regulations, and please their bosses, some contracting officers have entered into commercial item contracts without first determining that the prices were fair and reasonable. Performance-based payments (PBPs) for non-cost-reimbursable contracts are the Government's preferred financing method when the contracting officer finds them practical and the contractor agrees to their use (see FAR 32.1001(a)). The 2017 NDAA, as we discussed yesterday, removes the qualification "when the contracting officer finds them practical and the contractor agrees to their use" making PBPs the unquestionable preferred financing method. There's a lot to like with PBPs in lieu of Progress Payments based on costs. With PBPs, once contractors achieve a predetermined milestone, it gets paid. Progress payments on the other hand require considerable administrative effort including cost roll-ups, liquidation rates, subcontractor billings, loss ratio calculations and more. other quantifiable measures of results. Typically, the contractor proposes the PBP events and amounts but the contracting officer will review them to ensure that they result in equitable financing arrangements. The risk to the Government is paying too much up front where the amount of the financing is not commensurate with the milestone. Certainly the Government would not want to be in a position where it has paid half the cost of the contract at, say, ten percent completion. The Government has developed a user's guide to facilitate the establishment of performance-based events. Although written for contracting officers, the guide can be very useful to contractors as well - especially establishing proposed performance-based events and assigning payment amounts to (or valuing) those events. 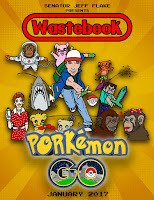 That Guide can be downloaded here. We're beginning to think that Congress believes that the Defense Contract Audit Agency (DCAA) has become a stumbling block to efficient and effective Government contracting practices. Last week in discussing Sec. 820 of the 2017 NDAA (National Defense Authorization Act), we noted a provision that will effectively eliminate DCAA from auditing indirect costs in favor of privatization. DCAA can still audit the direct costs but will have no role in auditing indirect costs. We're not sure how that will work out in practice however. One cannot develop indirect expense rates without auditing both direct and indirect costs. Someone, either the independent public accountant or DCAA is going to have to marry up the two sides to come up with final rates. And, most likely, the two organizations will be on different auditing cycles which may be the undoing of the entire concept. Performance-based payments shall not be conditioned upon costs incurred in contract performance but on the achievement of performance outcomes. The Secretary of Defense shall ensure that nontraditional defense contractors and other private sector companies are eligible for performance-based payments, consistent with best commercial practices. In order to receive performance-based payments, a contractor's accounting system shall be in compliance with Generally Accepted Accounting Principles, and there shall be no requirement for a contractor to develop Government-unique accounting systems or practices as a prerequisite for agreeing to receive performance-based payments. The House version of the NDAA did not contain a similar provision. During conference, the House agreed to the Senate provision with the added provision that reads as follows: "Nothing is this section shall be construed to grant the Defense Contract Audit Agency the authority to audit compliance with Generally Accepted Accounting Principles (GAAP). How will a contracting officer determine that a contractor is GAAP compliant? If the contractor has "audited" or "reviewed" financial statements, there is independent assurance that the accounting system complies with GAAP. However, the majority of Government contractors will not have audited or reviewed financial statements so then it becomes problematic for the Government to ensure that a contractor's accounting system is GAAP compliant. Perhaps the Government can rely on self-certification as it now does with any number of contractual requirements. However GAAP compliance is to be determined however, don't expect that DCAA will have any role in the assessment. There have been many comptroller bid protest decisions involving late proposal submissions. Typically the protestor cites some extenuating circumstances as to why the Government should have but did not receive a timely submission. The Comptroller General (CG) however has never been very understanding of these arguments. , The CG typically finds, citing the Federal Acquisition Regulations (FAR) that it is the offerors responsibility to make sure the Government received the proposal. Its never sufficient or safe to assume that since you mailed, emailed, or FedEx'd a submission, that the correct Government office received it. Offerors are responsible for submitting offers so as to reach the Government office designated in the solicitation by the time specified in the solicitation. If no time is specified in the solicitation, the time for receipt is 4:30 p.m. local time on the date that the offerors are due. if it was transmitted through an electronic commerce method authorized by the solicitation, it was received at the initial point of entry to the Government infrastructure not later than 5:00 p.m one working day prior to the date specified for receipt of offerors. An exception to the foregoing are cases where there is acceptable evidence to establish that it was received at the Government installation designated for receipt of offerors and was under the Government's control prior to the time set for receipt of offers (difficult for a contractor to prove), or if the solicitation is a request for proposals and only one proposal was received. A recent decision illustrates one of the pitfalls when a bidder assumes too much. Washington Coach Corporation sent in a proposal via email where the return portion of the email transmittal showed that the Government received the proposal before proposals were due. Evidently the Government's email had a size restriction for attachments (which was not mentioned in the solicitation) and it got stuck in the Government's email system. The CG noted that "... it is an offeror's responsibility to ensure that an electronically submitted proposal is received by - not just submitted to - the appropriate agency email address prior to the time set for closing." While this rule may seem harsh, it alleviates confusion, ensures equal treatment of all offerors, and prevents one offeror from obtaining a competitive advantage that may accrue where an offeror is permitted to submit a proposal later than the deadline set for all competitors. See Washington Coach Corporation, B-413809: Dec 28, 2016.